1. What is happening with the Cloverleaf entry point? 2. What am I missing back in those hills? 3. Why is the Cloverleaf entry point so important? What is happening with the Cloverleaf entry point? The Cloverleaf entry point is not open because it needs a right-of-way from private property owners. On October 27 of this year ( http://goo.gl/ctqLh2 ) I was told that the city had completed its appraisal and was ready to meet with the property owners. "We have contact[ed] one of the property owners to discuss our next step; however, they will not be available to discuss until the first of the year. We will continue to do our best to reach out to the second owner and move this forward." I believe Cherry is trying to get this done, but I am disappointed that this discussion will not begin until the first of next year. What am I missing back in those hills? Well, the other day I took these pictures on the road going down toward the Cloverleaf exit. A very pretty area and I am anxious to for others to enjoy it as well. 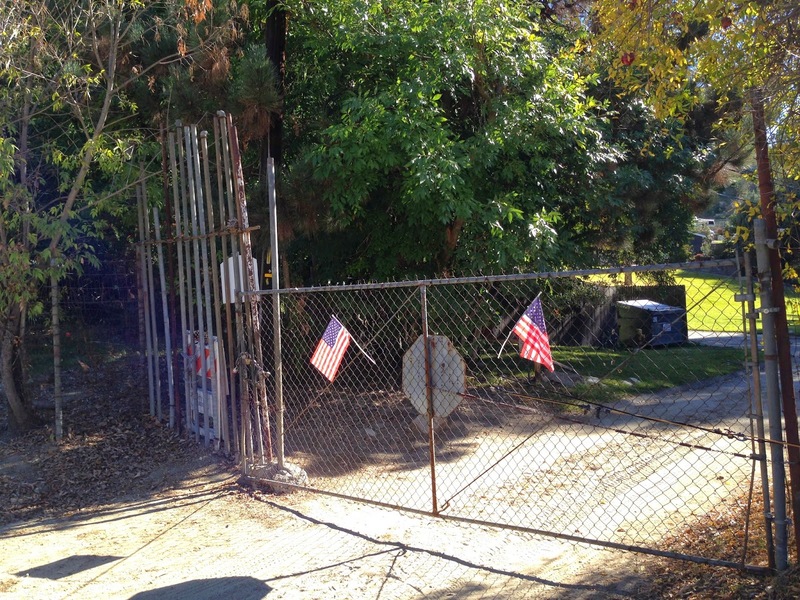 The problem is that at the bottom of the road you encounter this patriotic but very locked gate, and are faced with the dilemma of violating someone's property rights or going all the way back the way you came. Why is the Cloverleaf entry point so important? 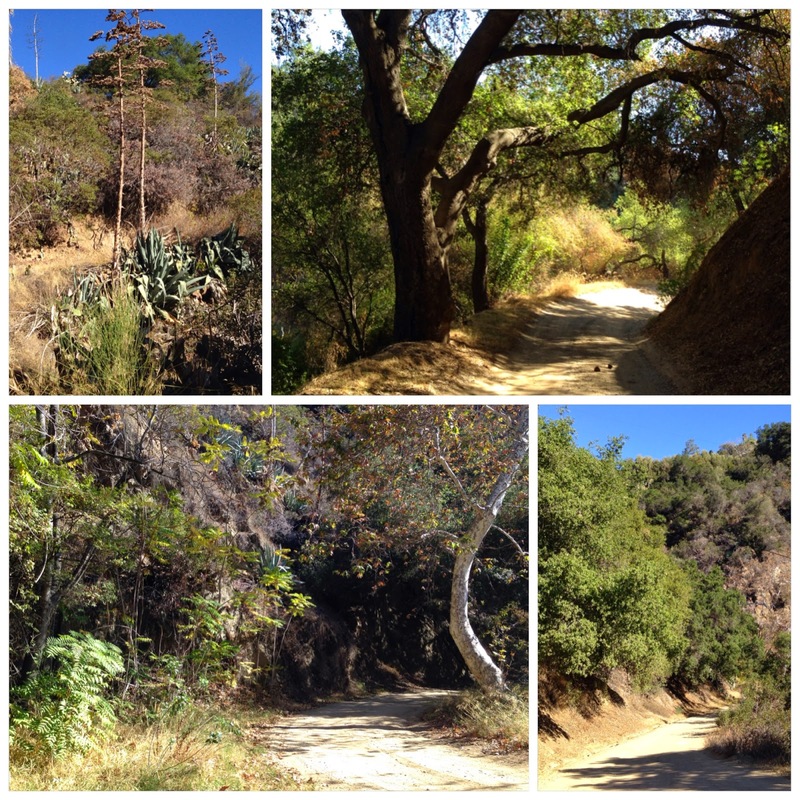 The Hillside Wilderness Preserve cannot really be enjoyed by most people unless Cloverleaf is opened. Consider this map (and please forgive my poor graphics skills). Suppose you began a hike or bike ride at the corner of Myrtle and Hillcrest, at the big blue dot. 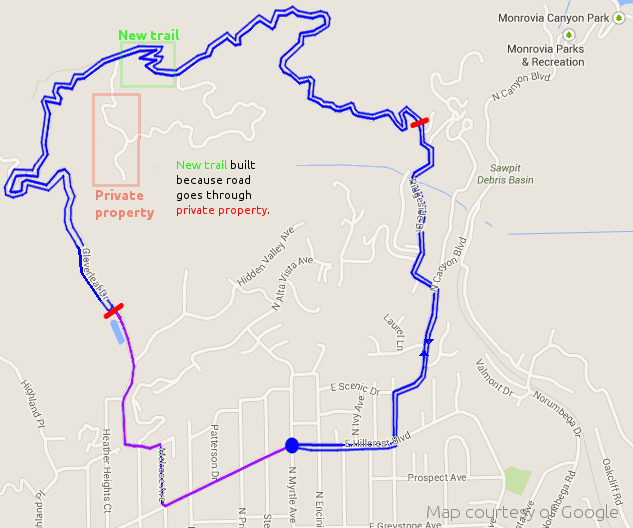 Following the blue line I've marked out, you walk up Hillcrest, onto Canyon, then Ridgecrest, then take what looks like a driveway to get to the Wilderness Preserve gate (the red bar), which you climb over and continue up, up, up to a point just before it says "New Trail." Congrats! You've made it to the top, and from your starting point you have climbed about 710 vertical feet (if my map reading is correct), plus a few miles horizontally. Now you head down, taking the zig-zag New Trail to avoid crossing private property. Down, down, down, down. About 600 vertical feet down to the Cloverleaf gate. Plus some more mileage. Whew! You are almost back at your starting point. You've had a great hike today and are glad you are almost done. The Cloverleaf gate (the other red bar) is closed, locked, and you will either violate private property if you climb it or squeeze through, or you will have to keep following the blue line and climb all the way back up and circle back the way you came. It would be so much easier if you could just continue on the purple line to get back to your starting point. If the City of Monrovia came to any of our doors and we told them to 'come back next year', and did this for 15 years, we would probably be in jail by now. People who have close relationships with the city councilmen in this city get some extraordinary treatment. And these property owners and city council were big proponents of the getting the rest of us shmucks to protect their land. Please, reconsider your opposition to keep from the public the "other" possible solutions, such as, the old ridge trial and connecting that trail to the Highland trail head and or the Santa Anita wash trail BTW the Santa Anita Wash Spreading Grounds are scheduled to become a wilderness preserve once it reaches capacity. . The public may like this option better as it keeps cyclists and hikers away from motor vehicle traffic (and their dust, noise, exhaust and risk of being squished) and since the right-of-way is uncontested/NOT private property the City will not need to expend any additional funds to gain lawful ingress/egress. I have to be honest, this access issue feels more like a battle of wills than reasoned policy.